The York County Libraries SummerQuest: Libraries Rock! summer learning program is officially underway and runs through August 19. Program guides are available at all York County Libraries now. The SummerQuest program is geared to kids and teens from from birth to 18 and features lots of free activities for youth and families. Once again, we have teamed up with the GO York! physical activity program. Plus, brand new this summer, area scouts can earn a badge by completing SummerQuest and GO York! activities! “With school out, learning and reading shouldn’t stop. SummerQuest is fun and a great exercise for the mind. It gives children a chance to learn, explore and discover new things through their library.” York County Libraries President Robert F. Lambert. Our libraries are providing a wide variety of free activities this summer including story times, hands-on science experiments, game nights, crafts, and dance. Children and their families may attend as many programs as they want, and then log completed reading and activities online to earn incentives. In addition to reading and library activities, the summer program encourages families to get out and explore area parks and trails through the Get Outdoors York initiative that is now in its 11th year. The guidebook for GO York! is included in the registration packet. Parents may notice a program name change this year. Statewide, there is a shift from summer reading to SummerQuest. These include the GO York! program to visit our parks, STEM programs to challenge inquiring minds and creative programs to support the imagination and curiosity of our children. Learning happens in many ways and the path to an exciting summer is the Quest offered by our libraries! Thank You York County Businesses! We would like to thank the many local businesses who donated prizes this year to encourage kids to keep reading and to stay active over the summer months. There are actually too many to mention! But we do appreciate all of you! In additon, it is because of the generous support of our corporate sponsors: the York Water Company, Glatfelter, and Wellspan Health, that is is free for all York County children and teens to participate in the SummerQuest program. We thank you! Pictured at top: York County Libraries Graphic Designer Jill Magee takes the first look at the 20,000 SummerQuest program guides delivered for families to pick up at their libraries. 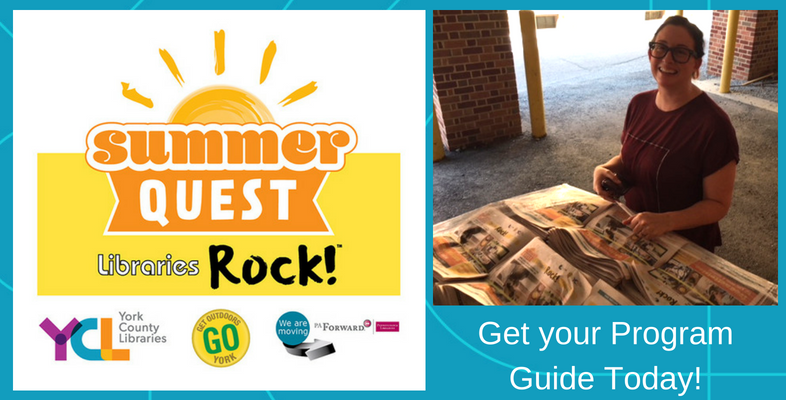 Jill created the program guide that highlights free SummerQuest activities happening at York County Libraries this summer.